England's second largest county is an outstanding area of ever-changing landscapes and exciting scenery – a top spot for camping in the UK. The county city of Lincoln, with its iconic cathedral, sits amongst a host of towns rich in heritage and culture. The long Lincolnshire coast is home to sandy beaches and bustling seaside towns, as well as family attractions for a fun day out. Lincolnshire hosts some great campsites and we’ve picked out our favourites; from luxury glamping in tipis and yurts to traditional campsites close to the coast. 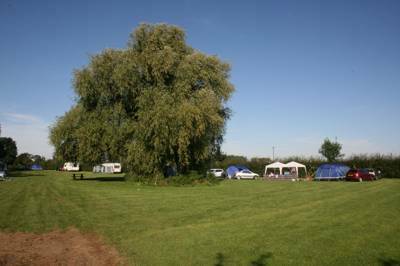 Take a look at our selection of some of the best campsites in Lincolnshire and book your next adventure online today. Long sandy beaches and an inland area of outstanding natural beauty make Lincolnshire a great place for a camping holiday. Although this huge county is often overlooked by holiday-makers from outside the Midlands, it hasn’t always been that way. In fact, it was here at Skegness that the first Butlins Holiday Camp opened back in 1936. So camping and glamping, of a sort, has been going on here for quite some time. The holiday parks remain and dominate the seaside resorts but away from the kiss-me-quick entertainment, out in the quieter parts of Lincolnshire, there are other types of camping and glamping sites too. Smaller sites with spacious pitches and quirky glamping accommodation where the owners go out of their way to make you feel at home. These are the sort of places we like to stay in – and we think you will too. The best campsite is not always the biggest, in the opinion of our travel experts. We look for places that have something special – a little extra charm or independent flair. It doesn’t have to be fancy in terms of facilities. In fact, sometimes we feel that the most-simple sites are the best – offering a back-to-basics experience and a break from modern life. But if it’s basic we’ll have selected it for another reason; a charming host, a spectacular location or incredible views for example. With some wild stretches of coastline, the rolling hills of the Lincolnshire Wolds and the wide expanses of its Fens, there’s plenty of natural beauty in Lincolnshire. In locations like these, camping can really immerse you in the scenery and give you the chance to see things you might otherwise miss. You’ll be outside at sunset and can wake with the birds’ dawn chorus; you can sit up and stargaze around the campfire and make the most of the sunny weather with daily barbecues. 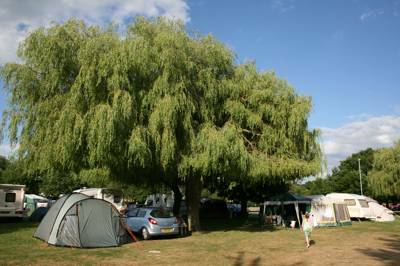 In areas of outstanding natural beauty, camping seems like the wise choice. You can feel smugly satisfied that your decision to camp is having the least impact on the environment. It’s probably the cheapest way to holiday too – not forgetting the fact that it’s the most fun! Although we find it hard to believe, not everyone’s idea of a good time involves pitching a tent. 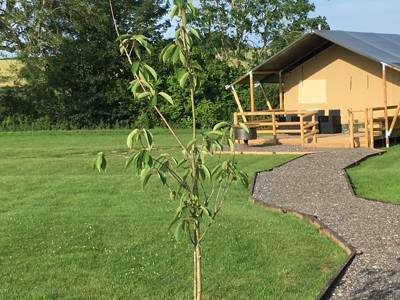 If you fall in to this category but still fancy a holiday that makes the most of the great outdoors, how about glamping in Lincolnshire instead? It’s also the way to have a camping holiday if you don’t have your own tent or want the camping experience outside the warmer weather. There are bell tents, tipis, yurts, safari tents, shepherd’s huts, treehouses and more. There are glamping sites across the UK that continue to amaze us with their quirky ideas for places to stay and there are places where you can enjoy luxurious touches like hot tubs too. You’ll find all these options among Lincolnshire glamping sites. The tricky part is deciding which to camp at. 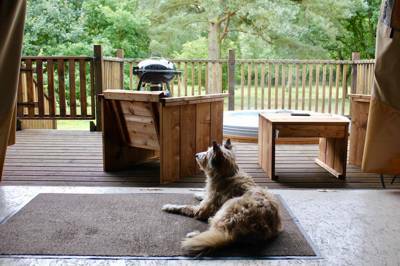 We take just as much care in assessing which glamping sites to include on Cool Camping as we do with our classic camping sites. And we’ve been in the business since the very beginning so we think we’ve got it sussed. We know the type of campsites that are popular with our legion of fans and we do our best to seek them out. It’s not always the showiest or most glam of glamping sites that we select – some are basic and some are pure bling but all will have had the thumbs up from our travel experts. Family camping in Lincolnshire is pretty easy to find – after all when is a campsite not family friendly? Okay, so there are some adults-only campsites (great for a quiet getaway) but most campsites are child-friendly by default. For youngsters (and, we would argue, us adults too) pretty much all campsites are full of adventure. You spend all day outside cooking on barbecues and campfires, you can watch wildlife and listen to the sounds of nature. The TV is off, the mobile phones are (hopefully) left behind and you can just relax. Playing board games inside the tent, kicking a ball about outside it, exploring woods and streams, bug hunting, tree climbing and den building. This is what camping means to us. And that’s not to mention getting out to explore everything that a new area has to offer. As a destination, Lincolnshire has some great family-friendly days out. The most obvious is the seaside. Choose between sandy beaches where you can picnic, paddle and build sandcastles like the one at Mablethorpe and the ice cream kiosks and funfair rides of bigger resorts like Skegness (more on those later). Other family friendly days out include farm parks, outdoor swimming pools and rides on steam trains so there’s likely to be something to satisfy kids of all ages – if you can drag them away from their new-found friends on the campsite that is! When it comes to beaches in Lincolnshire, Skegness is the one that everyone has heard of. It’s one of England’s original seaside resorts which became popular in Victorian and Edwardian times after the railway reached this stretch of coast. Butlins and other caravan parks later made it an affordable place for a holiday – especially for those in the landlocked counties of the East Midlands. Skeggy (as the locals call it) has continued to develop and add tourist attractions for more than 100 years now and it really has all the fun of the fair from traditional donkey rides to crazy golf and rollercoasters. The golden sands of its beaches have been awarded a Blue Flag. A few miles up the coast, the village of Ingoldmells is home to Fantasy Island, a huge amusement park, with a seven-day indoor market next door. Further north, Mablethorpe and Cleethorpes offer more traditional resort-style fun as well as sandy beaches – but there are places to escape the crowds too. For a wilder stretch of coast head to the national nature reserve at Gibraltar Point, just a few miles south of Skegness – looking out over The Wash. Saltmarsh, dunes and tidal creeks attract all sorts of birds here and it’s been an observatory since 1949. There are footpaths leading to hides and view points around the reserve. Further north there are more protected dunes and marshes at Saltfleetby-Theddlethorpe Dunes and the Donna Nook National Nature Reserve where you can see a breeding population of seals during the winter months. Lots of the campsites we prefer are tucked away from the bright lights of the seaside resorts in the rolling hills of the Lincolnshire Wolds. This officially-recognised Area of Outstanding Beauty features some of the most unspoilt countryside in the East Midlands. One of 46 AONBs across England, Wales and Northern Ireland, the designation, awarded in 1973, includes 216 square miles of chalk hills, hidden valleys and waterways. This part of Lincolnshire is often called Tennyson Country as it was in the little hamlet of Somersby that much-loved English poet, Alfred Lord Tennyson, was born. There’s not much to see apart from a church and (from outside only) the former rectory, where he lived. But it is said to have changed little since the 19th century when he grew up in the area so fans of his work might like to try and spot places that influenced some of his poems such as The Brook. Cycling, walking and horseriding are perhaps the best ways to explore the Wolds and you can find out about local routes by visiting the AONB’s website. Perhaps the best route is the Lindsey Loop, a long-distance 96-mile route around some of the highlights of the Wolds. If you don’t fancy doing the whole thing you can follow it for short stints to get from place to place. The town of Louth is considered the gateway to the Wolds and a foodie hotspot. It’s got lots of independent shops and a farmers market so it’s a great place to pick up a string of Lincolnshire sausages for your campsite barbecue or the ingredients for a picnic before a walk up nearby Hubbard's Hills. Lincolnshire’s Fens, in the county’ south east, are also a good place for a walk – and the flat landscape means it’s not too challenging. The Fens are part of east England’s coastal plain around The Wash, the square estuary above the bulge of East Anglia. This is where Lincolnshire meets Norfolk. It’s marshland that’s an important habitat for all sorts of wildlife and a hotspot for birdwatching too. There are lots of pathways and bridleways through farmland and along the drainage channels and waterways that keep this low-lying area from flooding. South-west Lincolnshire is higher ground and, perhaps, has more in common with the rolling countryside of the Wolds. This area is known as the Lincolnshire Vales. The number of grand houses and stately homes are a signal that the views are probably worth taking a look at! The Georgian town of Stamford attracts plenty of visitors who come to admire the 600 or so listed buildings and browse the independent shops and tearooms. 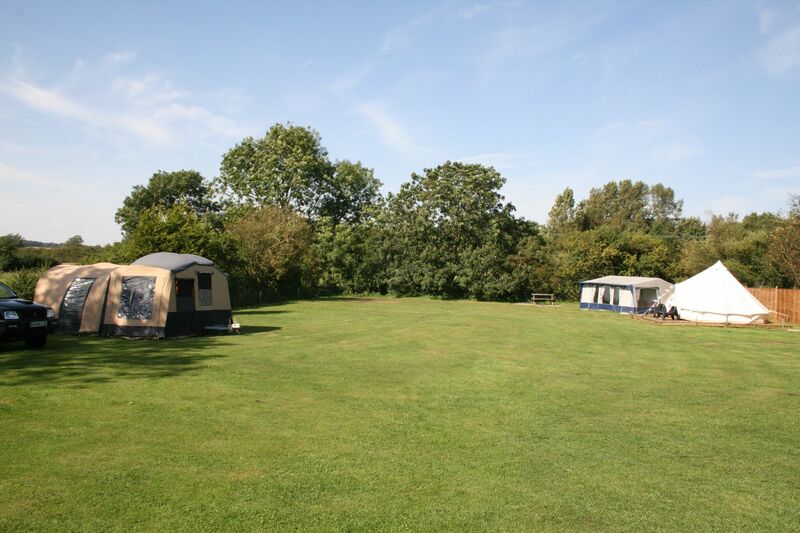 During a camping holiday in Lincolnshire you can easily fill your days with relaxing on the campsite, walking in the Wolds and strolling or sunbathing on the sands. But there are also plenty of attractions you might want to visit starting with Burghley House. One of the grandest houses of the Elizabethan era, Burghley is open to the public and has plenty to see from its modern ‘Gardens of Surprise’ to the collection of paintings by Italian old masters. Special child-friendly activities are often available in school holidays too. More recent history is remembered at The Lincolnshire Aviation Heritage Centre, a museum dedicated to the men of Bomber Command with aircraft including a Lancaster Bomber on display. Families with younger children might enjoy meeting the animals at Rand Farm Park. On sunny days head for the town of Woodhall Spa’s open-air pool and on rainy ones, you could take in a film at the same town’s historic Kinema in the Woods. There’s also the Lincolnshire Wolds Railway which has a museum and operates steam trains along a short section of track from Ludborough to North Thoresby, just outside the Wolds AONB. Lincolnshire at Campsites in Lincolnshire, There are plenty of campsites in Lincolnshire. Ranging from tent pitches and remote spots to romantic getaways and family-friendly camping. You won’t have trouble finding a campsite to suit you. Read reviews and then book your camping holiday today.